In Part 1 we covered ways in which you can use compost and mulch in an existing garden bed to reduce water usage. Now we will tackle a way to set up the garden bed to reduce water needs from the get-go! I’ve talked about the method before – it’s called Hugelkultur, and it hails from Eastern Europe. Hugelkultur has been used for centuries, but it’s only become more popular after the publishing of Sepp Holzer’s Permaculture. Hugelkultur works to conserve in two ways: Not only does the technique use all those trimmings from yard waste that go to the landfill, but the whole bed acts as a water sponge. That certainly works well with water restrictions in North Texas communities and reduces water bills. I’m going to repeat what I have written before – a 100 sq. ft. bed planted in vegetables is expected to need 60 gallons of water weekly – at least. I would love to see hugelkultur used in setting up school gardens. The reason is that school gardens are often promised water from the district for only the first year – after that, the garden manager has to devise other ways of providing water – usually rain capture. But reducing water needs is critical, whether the district pays the bill or rain is borrowed. Basically, hugelkultur copies what we find in a forest floor – dead and rotting trees, covered with limbs that fall, then by leaves which decompose and we have a soft, cushiony bed in which all sorts of life thrives. 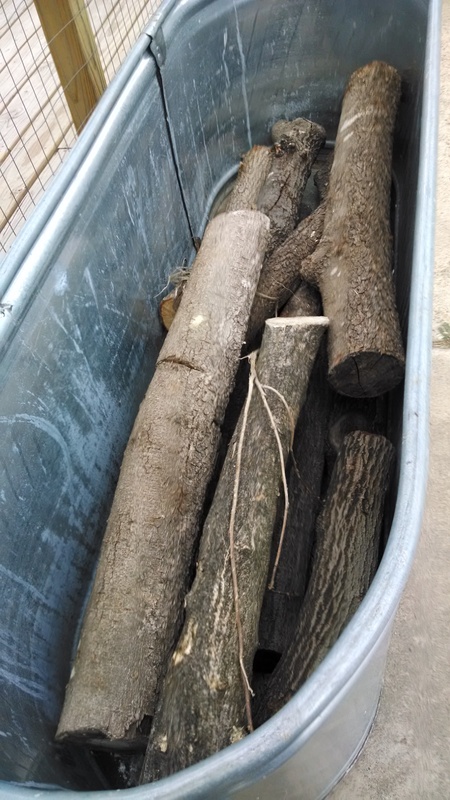 Here’s what happens: the logs (old or new) rot and become porous. They serve as excellent habitat for mycorrhizal fungi, which are essentially for healthy plants. AND, as the wood rots, it acts as a sponge for water. The end result is that hugelkultur beds don’t need to be watered nearly as often. I talked to a community garden manager last year, asking about the experimental bed she had put in. She stated that in October they had built the bed, planted broccoli, cauliflower and cabbage and – when I talked with her in February – they had still not watered since the bed was planted! 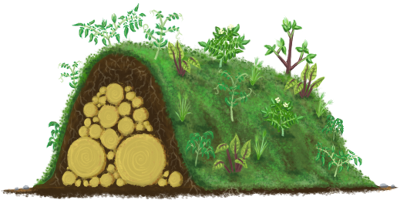 Traditionally, the hugelkultur process starts with a trench in which logs are placed, then twigs, then leaves, then compost and soil on top. It can be anywhere from a foot high to several feet. It all depends on where you live, what you want to put into it, and how high you want it to go. You can even install a hugelkultur bed for ornamentals that your HOA will approve of – just start with a trench and only go as high as 12” for the mound. Many front yard plantings go that high with mulch on top. The bed doesn’t have to be in-ground either. Hugelkultur can be built on the ground, or in a container. 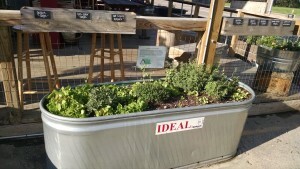 One garden I built was in a horse trough – I drilled ½” drainage holes about 8” apart on the sides of the trough. 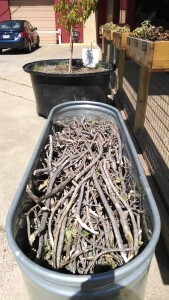 Then filled with logs, sticks, and straw, and covered with a layer of compost and planted herbs. I read online about a lady who takes muck tubs (they are the large plastic tubs with plastic rope handles often seen in barns for hauling…muck…), puts holes in the bottom and puts a short log upright in the tub. She then drills holes in the upper end of the log (to encourage water to go into the log), fills with leaves and compost and tops with soil. Then she plants. She says at the end of the season, after having reduced the water needs in her muck tub containers, her plants have grown their roots around the log. I’m going to have to try this I think this winter! We adapted hugelkultur last month, when we built a formal keyhole garden. The home owner had trimmed crape myrtles and was about to put them out on the street for pick up. We put those trimmings in the bottom of the keyhole garden, along with leaves, cardboard, dryer lint, straw, compost and then top soil and mulch. The garden will be a compost pile with hugelkultur overtones…a mixing of two incredible water-holding, nutrient-rich planting environments. One caveat – the garden bed will decrease in height over time, so just keep adding mulch and compost on top. And you’ll have the richest, softest, best water-holding beds imaginable. Be creative. Use the concept and let me know how you have used this technique that mimicks the forest floor. Posted in container gardening, drought, garden, gardening, hugelkultur. As I was driving through Plano the other day, I was thinking of California, which is in the news with state mandated water restrictions. There are signs on most well-travelled roads that watering restrictions are in force. Water conservation is good any time, but with a continuing drought, we have to re-think how we garden and how we water. There are a number of ways to reduce watering when installing/replanting a garden. First, the more organic matter that is in the soil, the more it will hold the water it gets. Sometimes folks use things to break up the soil and aerate it, but don’t realize that it isn’t helpful for holding water. Peat moss has been the favored clay loosener, but I was reading the other day that peat pots tend to cause soil to dry out faster – leading to more frequent watering. Does that mean that it also doesn’t hold water as well when mixed in the soil? A better amendment for potting is sustainably harvested coco fiber – it also holds water quite nicely. Coco fiber is that fiber on the outside of a coconut. It comes in bricks and I’ve seen them available at local garden nurseries such as Redenta’s as well as North Haven Gardens. The bricks are made of fibers that are dehydrated and compressed. The fun part is when you put that brick in a LARGE container to rehydrate (not the regulation 5-gallon bucket, which I heard one person busted during the rehydration process, because it wasn’t large enough). Put water in the water in the container with the brick and watch what happens – it’s great for kids to participate in this process. If you want to get mucky, start massaging the fiber off the brick into the water – you get a slurry of muddy mass. THIS is what you use to mix into potting soil or into raised beds to loosen clay, aerate the bed, and provide moisture retention. Because the coco fiber does hold moisture – you just witnessed this quality when you rehydrated it! So we need organic matter – that also means compost and lots of it! If you haven’t started your compost pile, now (whenever now is) is the best time. Never too late. 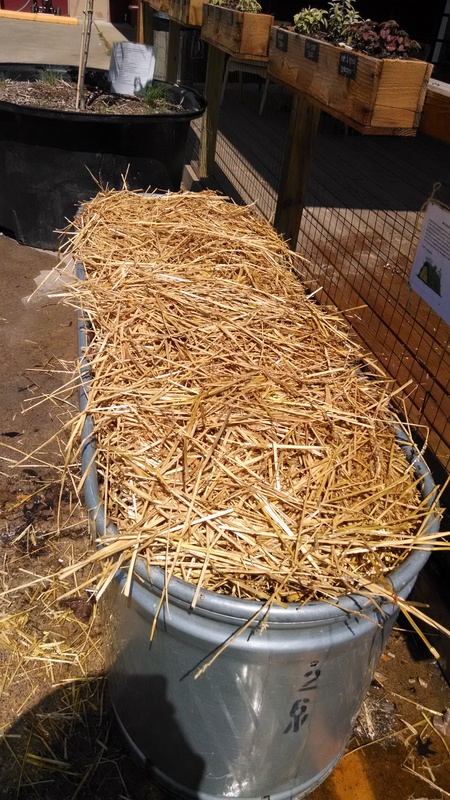 I’ll write another week on compost piles – the slow, the soon and the real quick methods. You can also buy compost (bagged or by the pickup load or by the dump truck load) from folks like Soil Building Systems. Organic matter – lots of it. That’s number one. Then there’s mulch. Lots of it, too. Mulch can be bagged stuff you get from the nursery, or delivered by the dump truck, or gathered yourself on the side of the street (read: leaves in bags). 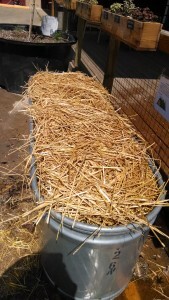 You can also buy straw (not hay) to use as mulch. Newspapers work, as does cardboard, spread around your plants and watered in well and then covered with leaves (watered in well also). Leaves make excellent mulch. Think of a forest floor and how the leaves carpet the ground, keeping it moist and soft, then deteriorating and becoming part of the soil. Leaves are also free. I should note here that if you get a dump truck load of mulch, you might want to invite some friends over to help you distribute it. 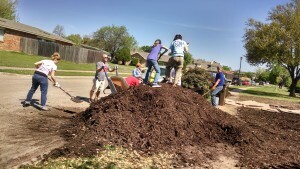 Here’s a picture of a mulch-spreading party this last weekend. All that compost and mulch results in less watering needed to keep your garden going and producing. In doing some calculations for a community garden’s rain water collection needs, I read that 100 sq. ft. of conventional vegetable garden needs 60 gal. a week at 60 degrees Fahrenheit. Obviously as the temperature goes up, more water would be needed. I couldn’t find any figures for how much mulch and organic matter reduce that, but I’ll bet it’s quite a bit – maybe as much as 50%. Be kind to your water bill – and conserve. In Part 2 (next week) I’ll talk about how we can build garden beds that require even less water. Posted in compost, drought, garden, garden planning, gardening, mulch, Uncategorized.